If you can get the light to turn off and on, press CTRL + ALT + DEL and End Task the frozen program. Otherwise, proceed through each of the follow sections in order. A computer locking up or freezing is often is caused by software related issues. If you are encountering lockups when the computer is opening a particular program, make sure you have all the latest updates for all running programs. You can find the latest updates for your software through the software developer or publisher. Each program or window you open on your computer takes some of the computers resources to keep it running. If you have too many programs open at one time, your computer may be low on resources, and as a result, is freezing. Try only running one program at a time to make sure your freezing is not being caused by multiple programs running at the same time. A computer lock up can also be caused by outdated or corrupted drivers. For example, if there is an issue that exists with your video adapter drivers, your computer could lock up while playing a game or watching a movie. First, make sure no errors exist in the Windows Device Manager by opening the Device Manager and verifying that no “Other Devices” are listed. You’ll also want to check the device list to see if any of them have a yellow exclamation mark or red X next to them. If they do, you’ll want to visit our page on identifying problems in Windows Device Manager. Next, make sure you have the latest drivers for all major devices in your computer (video, sound, modem, and network). A listing of driver-related pages, as well as driver-related help, can be found on our drivers page. If the computer processor is getting too hot, it can cause the computer to freeze. If you have heard any abnormal noises coming from your computer recently, such as a high squealing, it could be an indication of a failing fan. You can first start by verifying the fan on the power supply is working by examining the back of the computer and seeing if the fan is moving and moving smoothly. For the other fans in the computer, you have a few options. You can either open the computer and physically inspect them or, if the computer monitors the RPM of the fans, enter CMOS setup and make sure the BIOS does not report any errors. A hardware malfunction or misconfiguration can cause a computer to lock up. If you have recently added any new hardware into the computer, temporarily remove it to make sure it is not the cause of your issue. Before attempting to remove any hardware, make sure the computer has no conflicts in Device Manager. If you have not recently installed any new hardware, the next best solution is to remove certain components one by one. For example, you may remove your modem, network card, sound card, or any other expansion cards because they are not needed for the computer to operate. Run the computer without these cards to see if they are the cause of your issue. You should also try unplugging any peripheral (plugged in) devices one at a time to see if they’re causing your issues. If you have tried all the above recommendations and the computer continues to lock up frequently, it’s possible that Windows may have been corrupted. Try running through the basic troubleshooting steps for your version of Windows on our basic troubleshooting page. If these additional steps do not resolve your issue, we suggest you backup all of your valuable information, and then erase and reinstall Windows. If your computer turns off abnormally during or after the installation of your operating system, hardware components inside your computer may be malfunctioning. If so, the failing hardware is likely the RAM, CPU, Motherboard, or Power Supply (in that order). 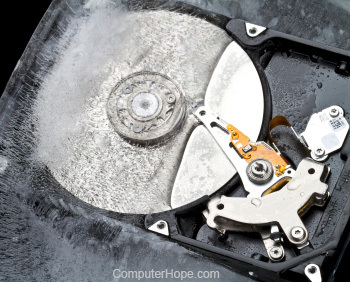 If you access the same parts from another computer known to be working, try swapping the parts to isolate the faulty hardware. Otherwise, you need to have the computer serviced. ← How do I clear my Internet browser history?